Learn how to grow your own vegetables in a container at the next CSUN-al Gardening glass. 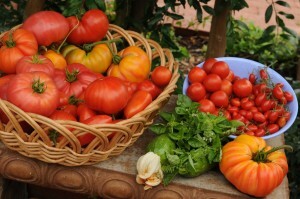 Growing vegetables in the backyard (or front) is one of the most convenient ways to make your diet a little healthier. But what can you do if you don’t have a big backyard, or if the yard is not in the best location for growing vegetables? Growing vegetables in containers is a versatile way to turn sunny-but-small spaces such as balconies, side yards and driveways into food-producing mini-garden plots. The public is invited to explore the possibilities at the next CSUN-al Gardening class on Saturday, March 25. Popular garden designer Steve Gerischer will share his favorite methods and strategies for growing vegetables in containers. Gerischer will provide details on container types, soil preparation, site selection and seasonal variation. Registration for the free class is required. Please email botanicgarden@csun.edu to request a space in the class or for more information. Driving and parking instructions, as well as the class meeting location, will be sent upon registration. CSUN’s Botanic Garden is operated by the university’s Department of Biology, and serves as a field site for botany, entomology, photography, painting and other classes. In addition to geographically themed plantings and a butterfly garden, the garden also features greenhouses where noteworthy botanical specimens are grown. The garden is open to the community. Visit the Botanic Garden website at www.csun.edu/botanicgarden/ for more information.